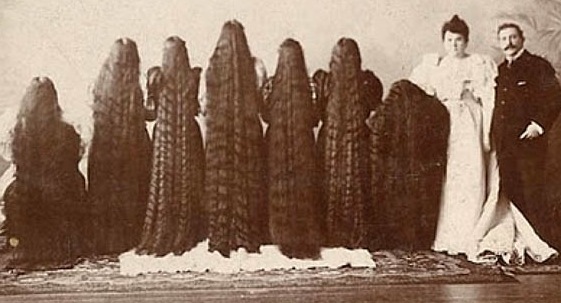 Heroes, Heroines, and History: The Seven Sutherland Sisters & their 37 Feet of Hair! 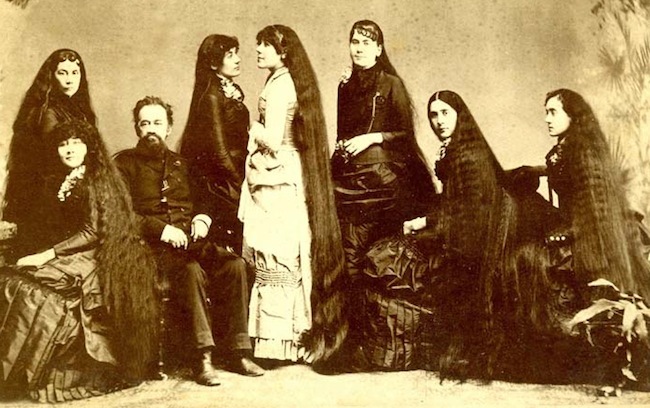 The Seven Sutherland Sisters & their 37 Feet of Hair! In the 19th century when proper women pinned up their hair, the seven Sutherland sisters were letting theirs down. Sarah, Victoria, Isabelle, Grace, Naomi, Dora, and Mary sang and played a variety of instruments, but people didn't come to watch them for their musical ability. Instead, they came to admire their super long hair--thirty-seven feet of it. The sisters were born between 1845 and 1865 and lived a hardscrabble life on the family's turkey farm in Cambria, New York. 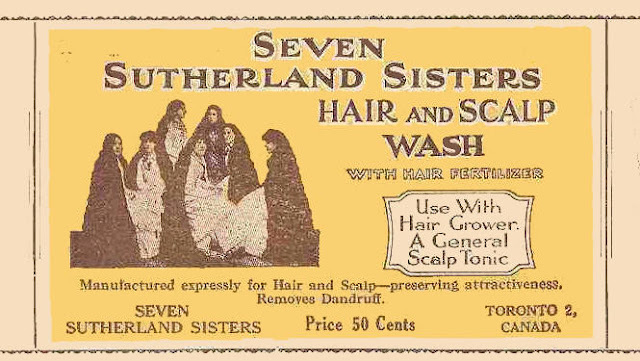 Their mother, Mary, would slather the girls' hair in a nasty smelling ointment, which she believed would make their hair grow thick and strong. The girls' classmate shunned them because of the foul smell. When their mother died in 1867, the girls were finally freed from the foul-smelling oil. After his wife's death, Fletcher Sutherland pursued fame and fortune by exploiting his children. Along with their one brother, Charles, the sisters toured churches, fairs, and community theaters in Niagara County, singing and playing instruments. 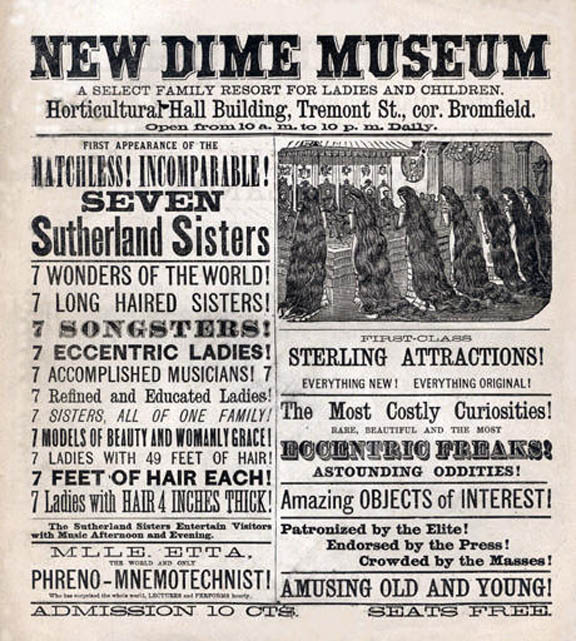 By 1880, the sisters, billed as The Seven Wonders, made their Broadway debut. By 1881, the sisters took their show on the road, touring the South and visiting cities like Pensacola, Mobile, and New Orleans, before attending the first World's Fair in the South, the International Cotton Exposition in Atlanta. No matter where they went, they wowed audiences when they'd unleash their floor-length locks. Sarah, the oldest sister and leader of the group, had hair only three feet long and would often sit during exhibitions and photo shoots. Victoria had the longest hair--7 feet--and when she let it down, it would drag behind her like a train. The youngest, Mary, was mentally unstable. Some doctors and preachers went as far as blaming her 6 feet of very heavy, dark hair for pulling on her head. In 1882, the sisters signed to travel with the W.W. Coles Colossal Shows, and by 1884, they had signed with Barnum and Bailey's Greatest Show on Earth as a side attraction. 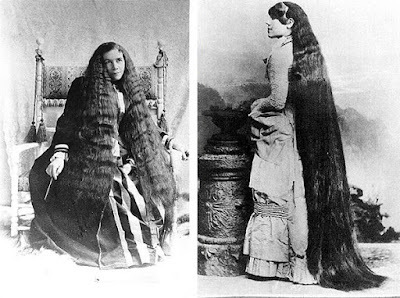 When flaunting their lovely hair on stage didn't bring in the money their father had hoped, he created a hair-growing tonic, which Victorian women fought to get. The family became rich almost over night, and the sisters became easily recognized celebrities whose hair was coveted by many. By the end of 1884, the Sutherland Sisters Corporation had garnered $90,000 in sales. By 1890, the sisters had sold 2.5 million bottles of the Hair Grower alone, raking in more the $3 million dollars. Sarah, Grace, Dora, and Mary never married, possibly for fear that a husband could take controlling interest of their wealth. 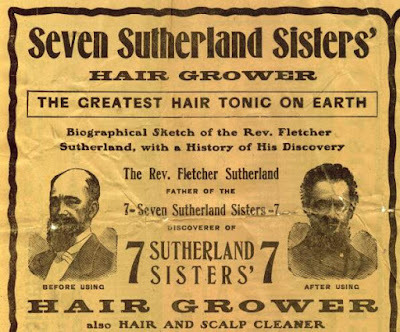 Fletcher died in 1888, and the sisters themselves became part-owners in the hair tonic company, which expanded to include a whole line of hair products including a comb, a scalp cleanser, and eight shades of “colorators,” as well as other cosmetics like face cream. I wish I could say this story had a happy ending, but the sisters eventually ended up broke, after living lavish lifestyles and wasting much of their money. The final death knell came in the 1910s when rebellious young women known as flappers began chopping off their hair. Mary ended up in an asylum. Dora was killed in a car crash when she and two sisters went to Hollywood in hopes of selling their story. A fire in 1938 destroyed the Sutherland estate, burning up a myriad of artifacts from the sisters' exploits and the recipe for the original tonic. And so the headline-stealing wonders of the Victorian era faded into obscurity. I hadn't heard about them either but a friend texted me a link to their story. I knew I had to write about them here. What a fascinating story! I never heard of this before. What novels could be written around these facts! It seems like they'd all have headaches from carrying around so much hair. 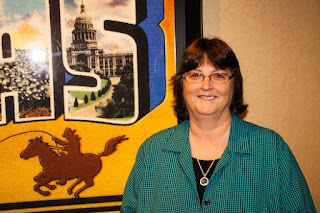 Thanks for the post, Vickie. I can't imagine living back then with so much hair and doing all their daily chores. Vickie, I loved this story. I can't imagine taking care of such long hair, but it is beautiful. Thank you for sharing. I know. I can't imagine living with all that hair. Even sleeping would be difficult when you rolled over. Thank you for the interesting story,Vickie! It's too bad the sister's story didn't have a happy ending. 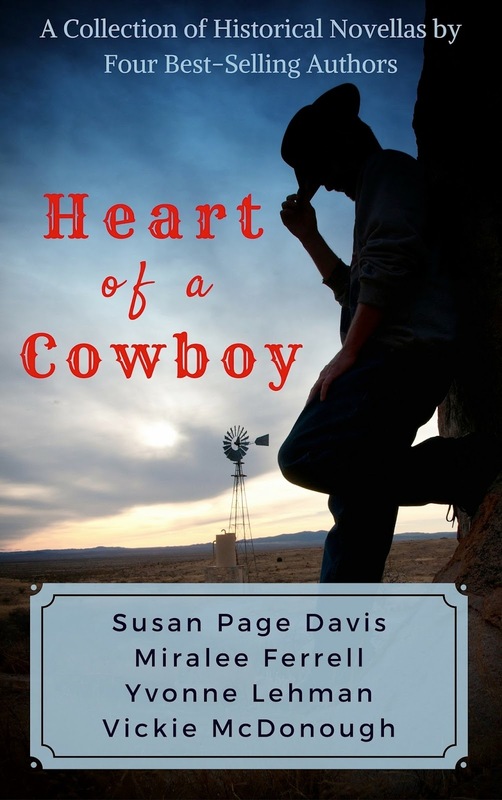 Thank you ,too for the post about your novella.Sounds like a definite must read! Yes, it is. It's one of those stories where the people couldn't handle having so much money when they'd been so poor previously. Fascinating tidbit of history. Love the line "death knell came in the 1910s when rebellious young women known as flappers began chopping off their hair." Their lives would have been so strange to live on several different levels ... the freak show aspect, being used by the father, jealousy between them, getting so sick of caring for the hair and not able to cut it, drawing attention wherever they go, trying to have friendships other than sisters, to name a few. And what about issues the brother may have suffered? It goes on and on. You're so right, Janet. They couldn't go anywhere without being recognized and talked about, especially in a day where woman going out in public with their hair down was frowned upon. Yikes! I can't imagine hair that long. It must have weighed a ton. I saw something about a family with long hair, but I was thinking they were more modern. Maybe it was the sisters here. Fascinating story and sad they didn't really have a normal life and that it ended so sadly. Very interesting. Like the other commenters, your story immediately made me wonder what life was like for the sisters away from the spotlight. I can imagine the rivalries, pecking order, trying to find romance or individuality. Maybe the brother fared best and only tagged along when it suited him. They must have been very talented, intelligent & ingenious women to make a name for themselves in that day and age. Thanks for posting. Love all the articles here.